Port Blair, Jan. 9: The President of India, Mr Pranab Mukherjee will be on three day visit to Andaman and Nicobar islands from Saturday, 11th January. He will arrive at Port Blair on 11th morning. He will be given reception and guard of honour on his arrival at the airport. He will then proceed to the National Memorial Cellular Jail and lay wreath at the Martyrs’ column there. In the afternoon at 4 hours, a civic reception will be hosted by the Port Blair Municipal Council in honour of the President at the historic Nethaji Stadium at Port Blair. 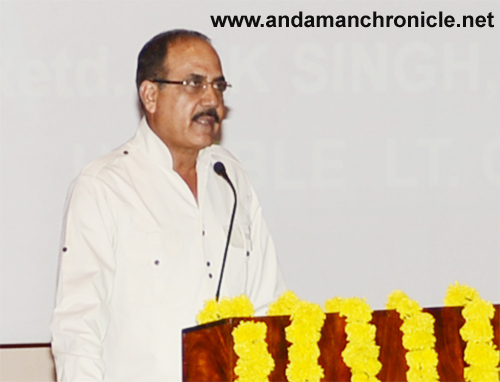 The Chairperson of the PBMC, K Ganeshan invited everyone to attend the civic reception. On Sunday morning at 11 a.m., the President will inaugurate the newly formed Andaman and Nicobar Tribal Research and Training Institute(ANTRI) at Haddo. He will also address the invitees on the occasion. On 13th morning he will proceed to Car Nicobar. He will visit the Mus Cathedral Church around noon. He will then visit the Tsunami Memorial at Big Lapathy village and pay homage to those who lost their lives in Tsunami. The President will also interact with the tribal leaders and other Communities at Car Nicobar. He will inaugurate the Animal Husbandry farm there at 1 p.m. In the afternoon, he will witness the traditional boat race and cultural programmes presented by the Nicobarese. Port Blair, Jan. 6: Lt Governor, Lt Gen (Retd) A. K. Singh, today said that the focus of the Administration is to provide a responsive, transparent and corruption-free Administration to the people. These three key words will be the guiding force for the functioning of the Administration, he said. Addressing the junior rank as well as top level officers of the Administration at DBRAIT auditorium here today, the Lt Governor dwelt at length on the positives, the challenges and his vision for the development of the Islands and how his vision can be translated into actionable goals and objectives. “I am proud that I got an opportunity to serve the people of the Islands and lead a team of officers who are well qualified and competent to deliver”, he said, and added that his vision is to ensure sustainable development of the Islands, keeping the ecological and the tribal concerns to the fore. Turning his attention to the officers present on the occasion, he said “whatever be my vision, the execution part has to be done at your level and till you understand the vision and how it can be achieved, you will not be in a position to deliver”, he said. Underscoring the need for reducing the dependency on the Administration, the Lt Governor said that the society here is highly educated and aware of their rights. “While people of the Islands are aware of their rights, they also need to understand that they have obligations to the country, the Islands and the society”, he said. The Lt Governor further said that although the officials working in the Administration are well qualified and competent, it should manifest in their output, which is not so at present. He added that there is a tendency to delay and not take decisions that are crucial to progress. Besides decisions taken are often not transparent giving rise to various apprehensions in the minds of the people. On the issue of corruption, he said directions have been given to the Chief Secretary to strengthen the Vigilance Department by deputing the best officers. “I will not accept any wrong doing and corruption in the Administration”, he said. Turning to the junior rank officers, he said progress and development can be possible only when the cutting edge officers work with zeal and commitment. It is the Director and his team, who has to deliver and must have a clear picture of the objectives and a plan to execute the vision. “Our junior officers should take interest and must look to translate the development vision into an actionable plan. Projects and schemes should, more often than not, move bottom upwards commensurate with the overall vision that he has for the holistic and integrated development of the Islands. Addressing the senior level officers, he said that they have to perform to their full potential. They have to provide leadership, take charge of their Departments and should not be afraid to move forward. The Lt Governor further stressed that the prime focus of the officers should be to serve the people and the nation, they should be humble in their persona, tough in action but gentle in speech, approachable to people and compassionate to the weaker section, including children and women. He added that they should discharge their duties “without fear or favour’ and in doing so, they should have integrity, competence and a commitment to work. The Lt Governor further stated that henceforth he will be scrutinizing the work of each Department/ Branch. This should not be construed as a threat but only a reiteration of his resolve to achieve sustainable development of the Islands. He concluded his address by saying: “There is a debt of service due from every man/women to his country/organization, commensurate to the bounties that have been measured to him/her”. He further added that “I am very conscious of this and will do my best to fulfill my obligations and the Islanders’ expectations”. 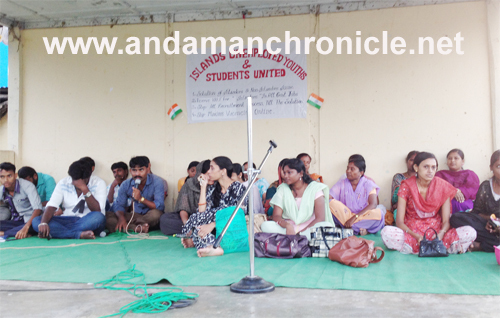 The Islands Unemployed Youth United have started their second phase of dharna from today 5th Jan. 2014 demanding for domicile rights in employment opportunities in Andaman Administration.